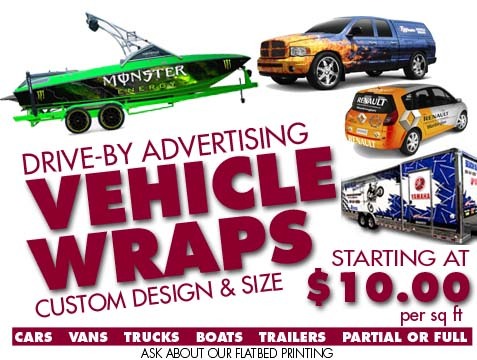 LET YOUR VEHICLE SCREAM ADVERTISING WITH A FULL WRAP (PROTECT YOUR PAINT AT THE SAME TIME!) You've seen it, you've thought about it, you've imagined your vehicle footing your advertising bill for you. Now its time to do it! We use nothing less then premium cast vinyls for vehicle wrapping and you are the beneficiary! Contact us at 386-252-9979 to discuss your vehicle and have us do the design wrap for you. For more information on Wraps and window perfs Click here. black and white newspaper ads, 30-second TV spots, magazine ads, radio spots, and billboards. And this exposure is 24 hours a day, 365 days a year for a very small investment.